"Can I ask you one thing...why does it have to be you?" My throat is dry but I manage to say the words clearly enough: "If I don't do it, who else will?" An entire country has been lied to. Silver Blackthorn was supposed to be one of the privileged few, chosen to serve and help rebuild a shattered nation. Instead, she is a rebel. Tales of her defiance have spread across the land. King Victor and the Minister Prime want her dead, the resistance groups are desperate for her help. But Silver's friends and family are in dire jeopardy; hiding is no longer an option. As her travels take her into the far reaches of an unknown land, she is forced to make new friends and hunt for new allegiances. Final battle lines are being drawn. The time has come. Then there's the hardest choice of all: Opie or Imrin. The adventure and rebellion of Silver Blackthorn ends here. The third and last book in the trilogy, RESURGENCE starts off with the rebellion still working to overthrow King Victor and the Minister Prime. (Off-topic note: It took me two times to write "Minister Prime" instead of "Prime Minister.") Let's dig into this book. Silver Blackthorn is perhaps one of my favorite characters in this book. She's not THE favorite character, but she is high up in the list. Intelligent, smart, and daring, she is the kind of leader the rebellion needs. She's not only the kind of person who reacts but also one who makes the action. She takes the initiative. Have I mentioned smart? Despite the large amount of resources her enemies have, she still can one-up them by skillfully wrangling her way out. Give this girl a round of applause. The villain has his flaws yet remains compelling throughout this book. Yes, he is loathed by me and almost every character in the story, but he is clever like how Silver is clever. (Though, he does have some help from his advisor, Minister Prime.) He is the kind of villain that is despicable, selfish, and vain. Have I mentioned selfish? And I just love to hate him. Such a glee to despise him and imagine bludgeoning him in the head. 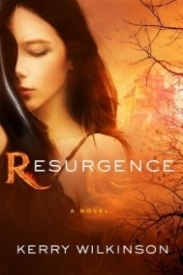 Overall, RESURGENCE is the fast-paced conclusion to the trilogy of Silver Blackthorn. It involves an insurgency and a cruel regime. It's a battle and a struggle, but it's an amazing and worthy one to watch. I dare you to read about Silver Blackthorn.